exeGesIS provide fast and affordable Public Path surveys. Previous Public Path surveys include small samples of public path networks and comprehensive surveys for large networks. For typical surveys we record every furniture item, path problem and agreed surface. 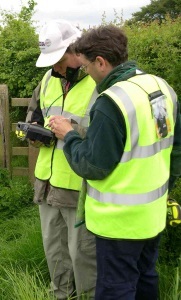 Each item is described, photographed and located, and its condition assessed. We assess the impact of any problems encountered on path users. We can also capture accessibility data, path deviations, risk and priority information, and almost any other specialist requirement you may have. Planning to establish your information requirements and to agree a survey methodology. Pilot survey to test and refine the approach. Survey preparation, including customisation of our CAMS Mobile software to meet your needs. Data analysis and reporting, including asset valuations, defects reports, Best Value Performance Indicators, scenario budgeting. Migration of data into your CAMS or other agreed data management system. We are happy to tailor any survey package to your needs. See our portfolio for example projects.